BISMARCK, N.D. – The SpartanNash Foundation today donated $18,500 to the Salvation Army as the result of its companywide fundraising effort to help end hunger in the communities it serves. Six Dan’s Supermarkets in Bismarck teamed up to support the Salvation Army. Between Aug. 31 and Sept. 11, the SpartanNash Foundation hosted a companywide retail scan campaign in each of SpartanNash’s 159 corporate-owned stores in nine states. Store guests and company associates who visited the stores during the 12-day retail scan campaign had the opportunity to donate $1, $5 or $10, with 100 percent of dollars raised going to support community food pantries such as the Salvation Army. 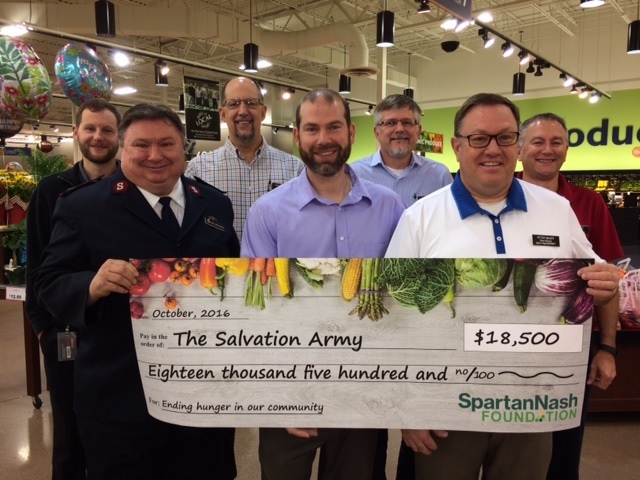 From left: Dan’s Supermarket Store Director Neil Heidt, Major John Flanagan of the Salvation Army and Store Directors Loren Olson, Kevin Bailey, Andy Dosch, Peter Bauer and Mike Mosset. The SpartanNash Foundation’s retail scan campaign to end hunger was its most successful companywide fundraising effort to date – raising nearly $300,000 on behalf of more than 100 local food pantries and food banks in the communities it serves. Store directors from each of the Dan’s Supermarket locations today presented the $18,500 on behalf of the SpartanNash Foundation. SpartanNash owns and operates the Dan’s Supermarkets in North Dakota, with the SpartanNash Foundation serving as the company’s charitable giving arm. SpartanNash underwrote the cost of the fundraising campaign so that all donations will benefit the local chapter of the Salvation Army and the families it serves in the local community. Each SpartanNash store personally selected the partner food pantry the campaign would support, ensuring the scan to end hunger would have a significant local impact. SpartanNash (Nasdaq: SPTN) is a Fortune 400 company and the leading food distributor serving U.S. military commissaries and exchanges in the world, in terms of revenue. The Company’s core businesses include distributing food to military commissaries and exchanges and independent and corporate-owned retail stores located in 47 states and the District of Columbia, Europe, Cuba, Puerto Rico, Bahrain and Egypt. SpartanNash currently operates 159 supermarkets, primarily under the banners of Family Fare Supermarkets, Family Fresh Market, D&W Fresh Market and SunMart.